Star Wars or Star Trek, Apple or Google, The Battle For Supremacy and Relevancy Thrives Here. People are cutting cords in droves this past year and I was one of them. I considered blogging each step of my experience and perhaps in hindsight it really was a missed opportunity because in so many ways so much went so so wrong; it would’ve been great fodder. Nevertheless in the next few posts I’ll hit the highlights of just what it takes to cut the cord and along the way offer some perspective after 6 months cord-free (which turns out is not entirely possible) and I will at least cover some of what went so very wrong because it’s so relevant to the conversation of just why so many people are cutting the cord in the first place. You’ll also notice I’ve decided to label this series by Acts and Scenes as if it was some long drawn out saga because really well it is! The whole process has been full of drama with highs and lows ranging from extreme rage to ‘Well I’ll be darned’ moments of surprise when things actually work really well so sit tight and enjoy. I hope my ongoing chronicles help tailor expectations for those just starting your own cord cutting journey or for some validate your choice to stick with cable and for others maybe just feel good to know somebody else feels your pain. Last year I posted New Year’s Resolution: Read The Bible and it ended up being the most read post of the year for ILikeTek. To ring in the new year I’ve decided to offer a followup post. As mentioned in the original post my app of choice was The Every Day Bible App however I ditched it midway through the year. There was nothing wrong with the app, in fact it delivered daily on what it promised to do but I found myself longing for an actual Bible….in print. I eventually filled this urge with the purchase of a study bible which came with free access to the study content in the publisher’s accompanying app (ESV Bible App). Wanting to go deeper into Bible study turned out to be a precautionary tail of be careful what you ask for as I picked one of the most in depth study guides available which in turn took up all of my available daily reading time and eventually led me to falling behind on my reading plan on days I opted to read other things. Since I’m not one to skip anything available to read in front of me I knew that if I was to get back on track and complete my New Year’s resolution I needed a straight forward approach for days when I just wanted to read the Bible and therefore it must exclude access to study material for those days. It was around then that I stumbled on to the NeuBible App. Herein the NeuBible App I found a beautifully polished app whose emphasis is solely on quick access to scripture with further emphasis on font. I love a good font and it has a crisp selection. I fell in love with the app’s straightforward approach with a simple swipe right gesture to select a book and swipe left gesture to select a chapter. Best of all it always remembers precisely where I left off even if it was mid-chapter which came in quite handy as though I wasn’t using the Every Day Bible App anymore I was still following its year long reading plan. Its plan was nice for its app where following from top to bottom every reading was laid out daily but trying to pick up outside the app was tedious since it jumped around to at least three different passages each day with some leaving off mid-chapter. My next dilemma was knowing what each day’s reading consisted of. This usually involved opening the Every Day Bible App to find out what it was and then opening whatever alternative app or print edition I chose to read from that day. This just felt silly so I decided to improvise. I would open the Every Day Bible App periodically and log ahead a few days’ readings into a list I created in my favorite to do list app – Wunderlist. This allowed me to set reminders which I could access from my notification center at any time and check off complete as I read each passage. It also helped me keep track of readings if I got behind easier than I was able to within the Every Day Bible App which reset each day. In fact returning to the most popular Bible app the Youversion Bible App for an occasional reading plan didn’t even offer reading plan visibility from its notification center widget like I now could through my Wunderlist… eh list. Now that I could get daily reminders and pick up my reading from any Bible app or print edition of choice I quickly got back on track and even finished my resolution to read the Bible in a year a few days early! Besides as most experts will tell you the best way to complete New Year’s resolutions is to form habits. For me daily checking off a year long goal and remaining mostly on track kept my other New Year’s resolutions fresh in my mind. While I didn’t complete all of them it’s safe to say I completed more and made more progress on others than any other year in recent memory in large part due to the daily satisfaction of checking off each daily Bible reading in my to do list. It’s no shock that good things really do come from reading the Bible every day! You may have noticed recently the supply for good old fashioned incandescent bulbs seems to be dwindling. You might have even heard that they’ve stopped making certain ones beginning this year. Myself I find it near impossible to locate clear 60W incandescent bulbs but an overwhelming selection of compact fluorescent bulbs abound. It’s like there’s some grand conspiracy to get you to stop using incandescent bulbs. Technically there is but it’s not as bad as you think and no they’ve not stopped making incandescent bulbs either; just check out this article from The Verge that debunks all the rumors here. The problem with switching to compact fluorescents is that nothing seems like an apples to apples swap. The packaging would lead you believe it’s a pretty straightforward affair by printing bold letters indicating 13W bulbs are 60W replacements and technically they’re right but that’s really where the similarities end. Buy two different brands and try to mix them within the same light fixture and you’ll see what I mean. One light is more blue, one is more yellow, and one is brighter. How do you pick the right one and how do you replace one brand with another? 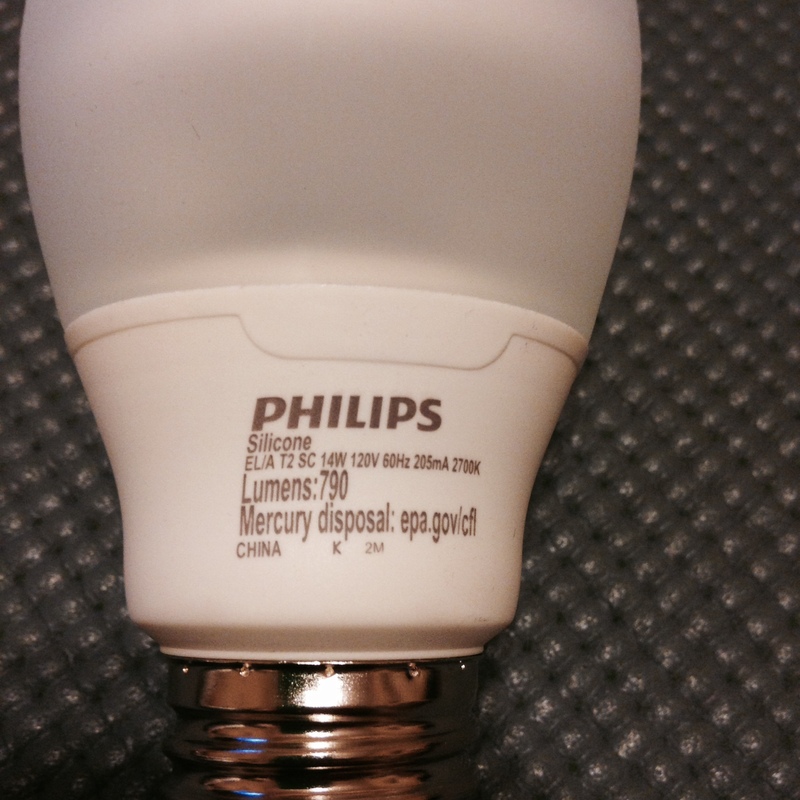 It really boils down to reading the fine print, literally on the bulb that is. There’s really three key specifications you want to try and match up closely particularly if you’re mixing different brands of compact flourescents. The first you already know is wattage. The package usually takes care of that by spelling out the incandescent equivalent. 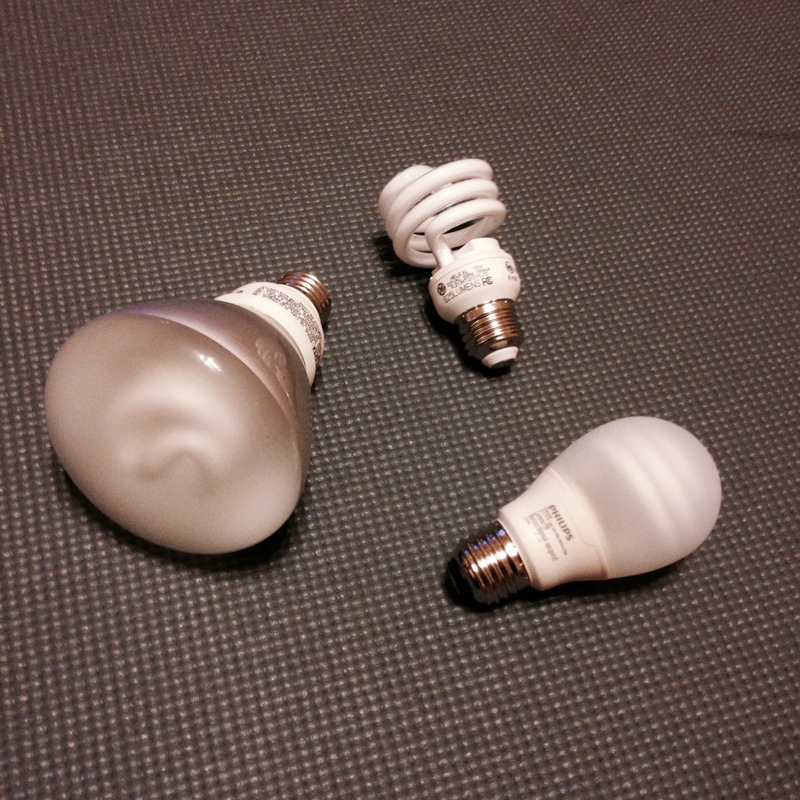 The second specification you want to pay attention to is bulb brightness. This is usually measured in Lumens. This is easy to follow, simply the higher the number the brighter the bulb. If you’ve got a fixture with 4 bulbs from Brand A and one burns out and you can only find brand B then you want to try and get this number to match as close as possible. You will also want to match the color temperature of the bulb. Color temperature is usually measured in Kelvins or simply ‘K’ as shown in the picture above measured as 2700K. The lower the number the yellower the hue of the bulb. The higher the number the bluer the hue becomes. That’s it. Wondering what it means? Click on the pic to find out.